As a leader of Afrobeat ensemble Antibalas, Martín Perna should need little introduction to SoundRoots readers. And you've probably also caught sight/sound of Adrian Quesada of Grupo Fantasma and Brownout along our musical journey here. So what happens when you put these two powers of Afrobeat/soul/funk/Latin music together? Three words: Ocote Soul Sounds. That's the group they've formed to bring new life to a delicious conga-infused soul/funk. Some parts of their new album Taurus could be a 70s soundtrack, but with hints of Ethiopian jazz ("Pirata"), Afrobeat ("STTP/Speak Truth To Power"), and psychedelic cumbia (Cumbia La Magdelena"). World music aficionados will dig the resulting mix, and so will funk and soul fans (who probably won't even realize they're listening to "world music"). Your sample today comes as part of a free mix tape via label ESL music. 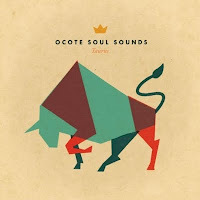 Ocote Soul Sounds' "Pirata" is the second track. Enjoy!